You can set up quick and secure desktop access to your Linux dedicated server environment using Virtual Network Computing (VNC) and a secure connection between the server and the desktop. Be sure to complete all steps below to ensure a secured connection. VNC is unencrypted and not safe over an open network, so all steps below are required to set up and secure the connection. Note: These instructions are for Linux servers running CentOS 6 or Fedora only. This step contains two installations: first, the GNOME desktop environment group; second, the VNC Server package. Both are installed using yum, which is available on your Linux dedicated server. Log in to your Linux dedicated server as root user via SSH (Secure Shell Protocol). Note: Using yum makes these installation steps quick and clean. Your desktop environment is now installed and so is VNC, which you use to access it. If you see that this file has been overwritten by NetworkManager, please contact customer support so we can give you the correct DNS resolvers. Here are the configuration steps required to access your desktop through VNC. Log in to your Linux dedicated server (via SSH) as the user you want to use to access VNC. 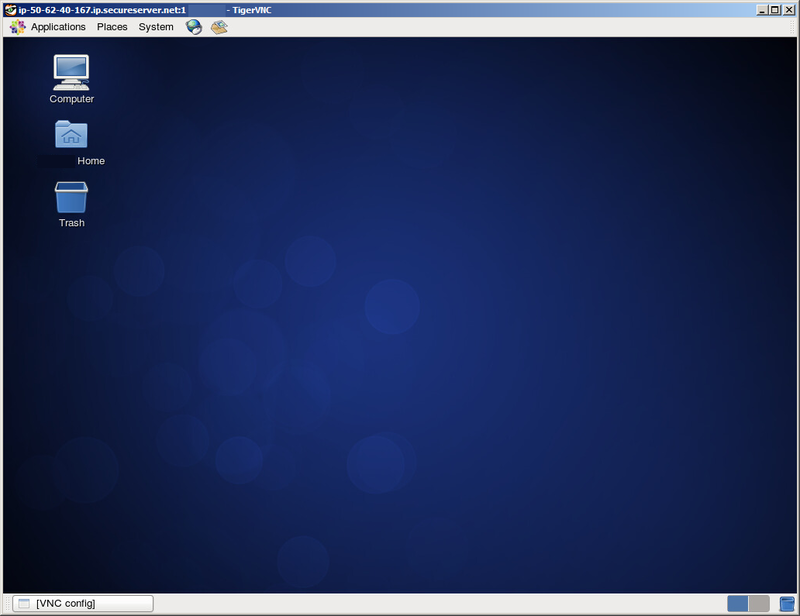 Note: When you access the desktop through VNC, use your VNC password to establish the VNC connection, and then the user's password to access the desktop environment. This process configures VNC to further secure connections to the desktop, set the base size to render the desktop, and identify the port to be used for remote desktop connections. Log in to your Linux dedicated server as root user via SSH. Using any plain text editor, open /etc/sysconfig/vncservers. 1 — This indicates the port used for the VNC connection. Only the last digit is entered and the first three are implicit. For example, 1 defines port 5901. 9 indicates use of port 5909. 1024x768 — This sets the size that VNC renders your desktop. You can optionally change it. -localhost — This option limits VNC to allow only local connections. This setting makes the VNC connection more secure when used in conjunction with an SSH tunnel. SSH tunnel setup is in the next section. Note: Use this last command at any time to verify that the service is started. After a reboot, for example. You've now completed configuration of VNC. The next step is to set up the secure SSH tunnel to access your Linux desktop. To securely access your desktop, you need to use an SSH tunnel to your server. The easiest method is to use PuTTY and save the configuration for use each time you access the server. Note: These instructions assume that you have a stored PuTTY session to connect to your Linux dedicated server. If you do not, consult PuTTY help documentation to create a session. Open PuTTY, select the saved session, and then click Load. In the Category section, from Connection click SSH, and then click Tunnels. Source port — Type 580, plus the port you specified in the VNC configuration file. Because we used port 1 in that example, here we would enter 5801. Destination — Type 580, plus the port you specified in the VNC configuration file. Because we used port 1 in that example, here we would enter 5801. Source port — Type 590, plus the port you specified in the VNC configuration file. Because we used port 1 in that example, here we would enter 5901. Destination — Type 590, plus the port you specified in the VNC configuration file. Since we used port 1 in that example, here we would enter 5901. In the Category section, navigate to Session. In the Saved Sessions field, type VNC Tunnel, and then click Save. Each time you access the Linux remote desktop, you open the SSH tunnel you configured in Step 3, and then open an Internet browser that has Java applets enabled to log in to VNC. Open PuTTY, select the saved session, click Load, and then log in to your server. This opens the SSH Tunnel that you configured in Step 3. Open your preferred VNC Client, type http://localhost:590[n] (where [n] is the port you specified in the VNC configuration file, and then press Enter. This opens a secure connection from your Linux server to your desktop and you should see a screen similar to the one below. After completing the process, you might want to remove the GNOME desktop environment group and VNC Server package. Both are removed using yum, which is available on your Linux dedicated server.